MLS stars Michael Bradley, Landon Donovan, Tim Cahill, and Eddie Johnson with Etihad Airways. ABU DHABI / NEW YORK (March 25, 2014) – Major League Soccer (MLS) and Soccer United Marketing, MLS’ commercial arm, today announced a multi-year partnership deal with Etihad Airways, the national airline of the United Arab Emirates. Within the new agreement, Etihad Airways becomes the official airline partner of MLS in the United States. It is the Abu Dhabi-based airline’s first multi-year sports sponsorship in the territory and one that underscores its expanding commitment to the U.S. market. Etihad Airways and MLS will also work together on a number of activations and initiatives including community programs, as well as hosting competitions and promotions for flights and holidays with MLS fans. The agreement will see the Etihad Airways logo and its messages beamed across LED pitch-side advertising during nationally televised MLS matches, as well as across national broadcast partners and MLS Digital Properties, the leading online soccer platform in North America. Major League Soccer represents the sport’s highest level in the United States and Canada, composed of 19 teams, with 16 in the U.S. and three in Canada. The MLS regular season runs from March to October, with the MLS Cup Playoffs taking place in November and December. MLS’ global presence continues to increase with the announcements of expansion clubs, New York City FC and Orlando City Soccer Club. Etihad Airways currently operates daily flights between its hub at Abu Dhabi Airport and Chicago, New York and Washington, D.C. In June 2014 it will launch daily flights to Los Angeles and in December it will start a three flights-a-week service to Dallas-Fort Worth. The airline has a premium lounge at Dulles Airport in Washington, D.C. and has plans to open one at New York’s JFK Airport and Los Angeles’ LAX. In addition to MLS, Etihad Airways’ sponsorship portfolio includes the Nation’s Triathlon in Washington, D.C., the Etihad Stadium in Melbourne, Etihad Stadium in Manchester, Manchester City Football Club, All Ireland Senior Hurling Championship, Harlequins Rugby Club, and the Formula 1 Etihad Airways Abu Dhabi Grand Prix. As one might expect, their routes are concentrated out of Abu Dhabi. But MLS clubs are unlikely to use those routes in common practice. How about their business in the United States? 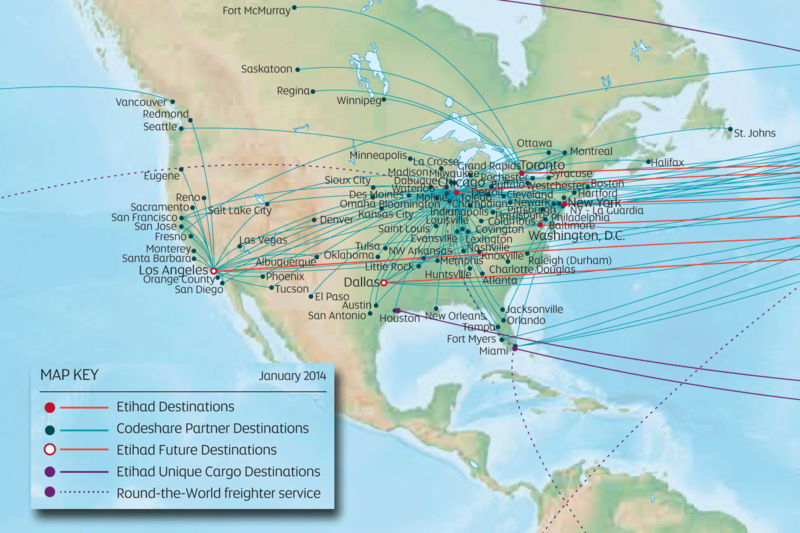 Setting aside their "Codeshare Partner Destinations" in blue and looking just at the cities to which Etihad itself flies, we have six locations in North America. We'll give them the benefit of the doubt and include Los Angeles and Dallas, listed as "Future Destinations." Those six cities are New York, Toronto, Detroit, Baltimore, Dallas and Los Angeles. All six are home to MLS clubs. That means the "official airline" of MLS only services six of the twenty-one MLS cities (we'll give MLS the benefit of the same doubt and include "Future Destinations"). The league's official airline doesn't even fly to three-quarters of the league's cities. Furthermore, of the league's cities Etihad does fly to, it doesn't fly between any of them. That means none of the teams can possibly fly on the league's official airline to any of their league matches. How very strange. Who what's in this deal for Etihad? Can't really be exposure in these markets they don't service or even plan to service. It's widely seen as laying the groundwork for another, very specific sponsorship deal. 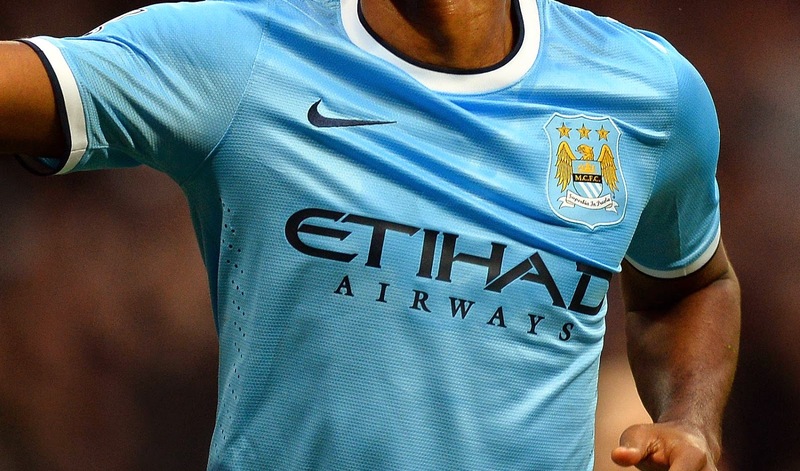 Since 2009, Etihad is the shirt sponsor of our very own parent club Manchester City. 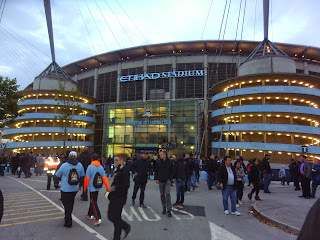 In 2011, they expanded that sponsorship deal to include naming rights for the City of Manchester Stadium (now known commercially as Etihad Stadium). That deal initially drew some scrutiny from UEFA; Etihad is the national airline of the United Arab Emirates, while Manchester City is owned by a private equity company itself owned by Sheikh Mansour bin Zayed Al Nahyan, the deputy prime minister of the UAE and member of the Abu Dhabi's ruling family. The deal was eventually cleared, but it illustrates the close relationship between sponsor and club. So. This seems clearly poised to set the table for New York City's shirt sponsorship. It makes perfect corporate sense, allowing an immensely wealthy owner to channel additional funds into his club, and Etihad will certainly pay more than any other company for the ability to cross-promote within its own corporate family. I don't think it's best for NYCFC, however. NYCFC has done a great deal to establish itself as a uniquely New York club. I have been hoping that the eventual choice of shirt sponsor would mean partnering with another uniquely New York company. 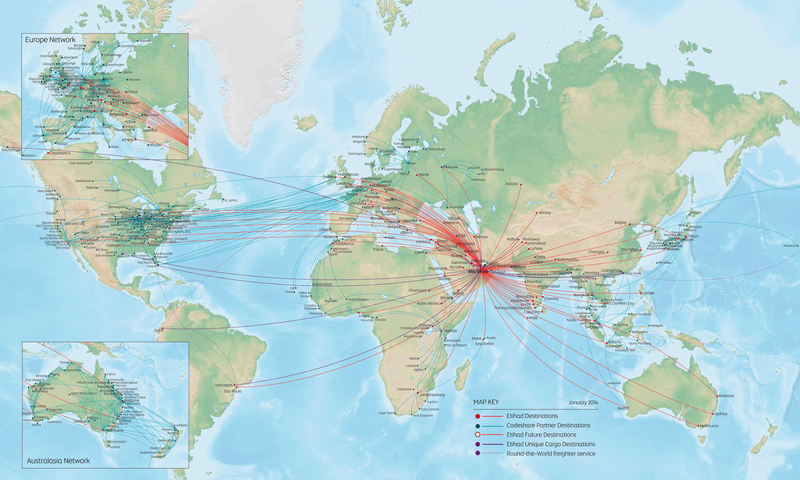 But Etihad has almost no presence in New York City, with no known plans to expand its service beyond the one route it has; JFK to Abu Dhabi and back again. Great for the club's bottom line, but not, I think, for the club as a whole. Play Fantasy Football for NYCFC Prizes!